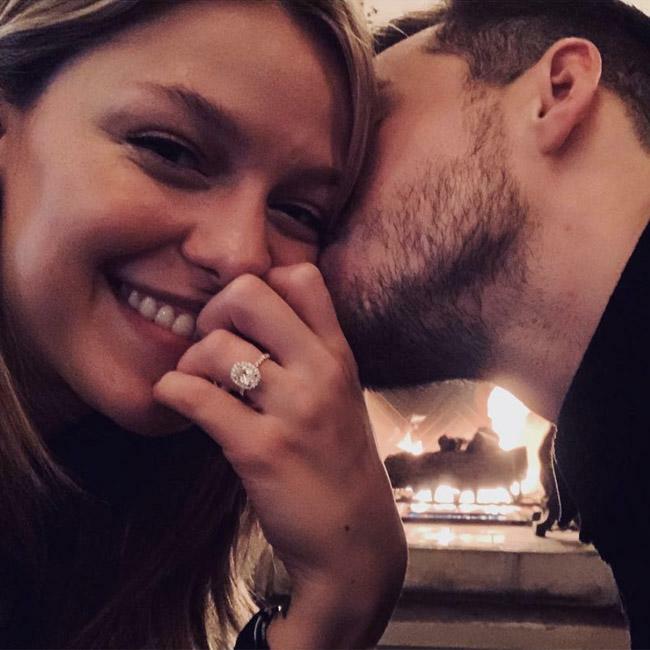 ‘Supergirl’ co-stars Melissa Benoist and Chris Wood are engaged. The former ‘Vampire Diaries’ actor revealed he had popped the question on Sunday (10.02.19) and admitted it was "the happiest" moment of his life. Alongside a selfie of the pair showing off her dazzling new diamond engagement ring, which Chris had designed himself with the help of fine jewellery designer Jennifer Meyer, Melissa wrote on Instagram: "yes yes yes it will always be yes. (sic)"
Whilst Chris, who can be seen planting a kiss on his fiancee’s cheek in the shot, shared the same picture to his profile, and added: "The happiest." He also hinted that it won’t be long before he ties the knot with the 30-year-old beauty. Alongside another snap of the pair dressed up for the occasion, he wrote: "not from our wedding BUT IT WILL BE SOON (sic)"
The pair first met in 2015, when the 30-year-old hunk joined The CW show as Mon-El, Melissa’s alter-ego Kara Danvers’ love interest. However, they didn’t start dating in real life until 2017, after the ‘Patriots Day’ actress divorced her ex-husband and ‘Glee’ co-star Blake Jenner in December 2016. Melissa and Blake initially filed for divorce in December 2016, citing irreconcilable differences, but there was no child custody or support issues to iron out because they didn’t have any kids together. According to TMZ, the former couple reached a property settlement but didn’t file it with the courts. They are said to have told the judge their issues were resolved and sorted out who received what from their two-year marriage, with Melissa taking back her maiden name. The former co-stars – who portrayed Marley Rose and Ryder Lynn – tied the knot in March 2015 surrounded by their family and close friends after he popped the question in July 2013.